Don't be Afraid of Your Phantom Tube - Kenny Woodward, Jr. The Close-Up Mentalism of Richard Webster - Flora & Co. 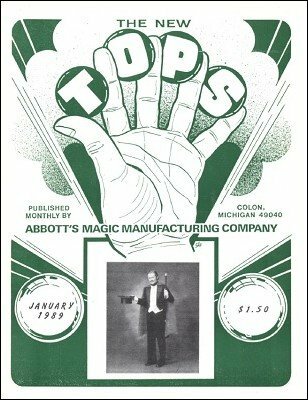 Practical Stage Hypnosis - David Harper - Flora & Co.
Magic Marketing Series Number 4 - audio tape - Flora & Co.
Memoirs of a Circus Magician - audio tape - Flora & Co.
Mentalists Round Table No. 1 - audio tape - Flora & Co.
Cover Story - re: Hal Diamond - Magician "Hangs Out" at Halftime Over the 50 Yard Line! I Left My Heart In Abbott's Magic Shop! Woody's Place - Kenny Woodward, Jr. So You Want To Split A Card! Producing a Promotional Video - A Performer's Guide - Flora & Co. The Balloon Business - audio tape - Flora & Co.
glue stick for paper bands around silks - Kenny Woodward, Jr. The Therapy of Laughter - audio tape - Doyne Michie - Flora & Co.
"Panef White Powdered White Lubricant"
Initiations - A Viewpoint on the Art of Cold Reading - Alexander Thomas - text and tape - Flora & Co.